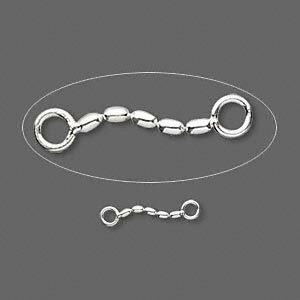 Extender chain, sterling silver, 15mm ball with 2 loops. Sold per pkg of 4. Extend your design possibilities. Use these extender chains to not only lengthen your jewelry, but to link between gemstone nuggets or strands of beads for easy-to-make layered necklaces. Or, dangle them for chandelier drop earrings. Use them with ball posts and earnuts to display sparkling pendants or charms. You'll be amazed at what unfolds.